True to their reputation as “prospectors of Baroque gold,” Artistic Director Paul Flight and the award-winning California Bach Society will perform the US premiere of Antonio Bertali’s Missa Redemptoris, for eight vocal soloists, chorus, brass, and strings. It is only part of the program of works by two Italian masters, Giovanni Valentini and his successor Bertali, who worked as Kapellmeisters at the Hapsburg court in Vienna in the 17th century. Performances of “Italian Masters in Vienna” are Friday, April 26, in San Francisco; Saturday, April 27, in Palo Alto; and Sunday, April 28, in Berkeley. 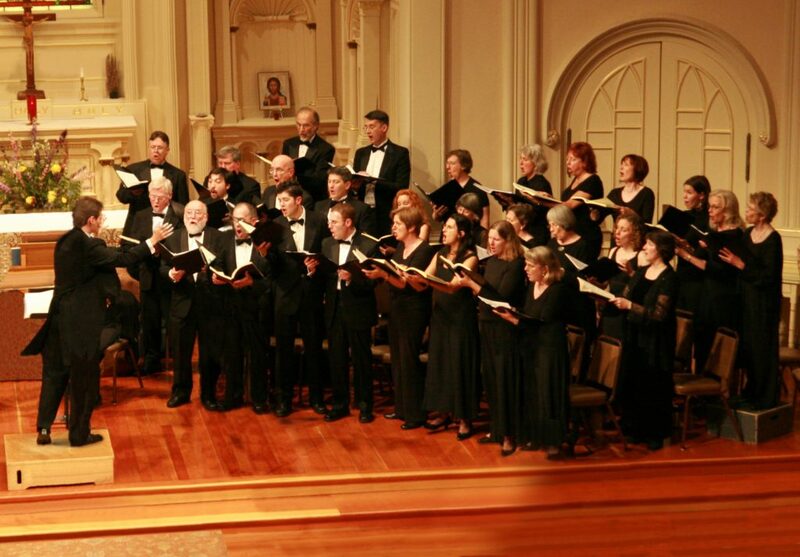 The 30-voice chamber chorus was awarded “Best Choral Group” and “Best Early Music/Baroque Ensemble” for 2017-2018 by San Francisco Classical Voice for their performance of Charpentier’s Missa Assumpta est Maria at the Berkeley Early Music Festival in June 2018. The chorus is joined by a period instrument orchestra of cornettos, sackbuts, and strings, featuring Alex Opsahl and Steve Escher on cornetto; Richard Van Hessel, Rebecca Burrington, Jonathan Thomas and Ernie Rideout on sackbut; Aaron Westman, Anna Washburn, Maria Caswell, and Amy Haltom on violin; Marieke Furnee and Amy Haltom on viola; with Amy Brodo on cello and Yuko Tanaka on organ. Vocal soloists are sopranos Christa Pfeiffer and Caroline Jou Armitage, mezzo-soprano Gabriela Estephanie Solis, tenors Tim Silva and Michael Desnoyers, and basses Clayton Moser and Adam Cole. In September 2014, Bruce Dickey led a performance of Antonio Bertali’s 22-part Missa Redemptoris at the Utrecht Early Music Festival. It was the European premiere of this impressive work for chorus, soloists, brass, and strings. Paul Flight was so enamored of the piece that he contacted Dickey. After Dickey agreed to make the score available for the California Bach Society, Paul Flight built an entire program around the music of Bertali and his predecessor in Vienna, Giovanni Valentini. Giovanni Valentini (ca. 1582–1649) was an Italian composer, poet, and keyboard virtuoso. Born in Venice, he almost certainly studied music under Giovanni Gabrieli there. Overshadowed by his contemporaries Claudio Monteverdi and Heinrich Schütz, Valentini is practically forgotten today, although he occupied one of the most prestigious musical posts of his time. He is best remembered for his innovative usage of asymmetric meters. In approximately 1604/5 Valentini was appointed as organist of the Polish court chapel under Sigismund III Vasa; his first published works are dated 1609 and 1611, when he was still in Poland. In 1614 he was employed by Ferdinand II (who was then the Archduke of Styria in southern Austria) and moved to Graz. The Graz court’s music chapel used enharmonic instruments extensively, which was of considerable importance for the development of Valentini’s style. In 1619 Ferdinand was elected the Holy Roman Emperor and moved to Vienna, along with the court and the musicians of the Graz chapel. Valentini served as imperial court organist in Vienna for several years, then became court Kapellmeister in 1626, and accepted the post of choral director at the Michaelerkirche in Vienna in 1627/8. Numerous works by Valentini exhibit considerable innovation and elaborate experimentation. His small-scale works such as motets and psalm settings are especially interesting musically. Most are written using a modern concertato style, with virtuosic instrumental writing and, in some pieces, extensive use of chromaticisms. We perform his settings of Psalms 150, Cantate Gentes, and 118, Iniquos odio habui. The Secondo libro di madrigali (1616) is one of the most important of Valentini’s secular works. It is the first published collection of madrigals that combined voices and instruments. These eighteen songs of love and war are passionate, tempestuous, and overflowing with the beauty of the early Baroque. The three madrigals that we present are Numbers 14, 15, and 18: a battaglia (a representation of a battle, (this one between lovers, not armies), a romantic ballad, and a dance. 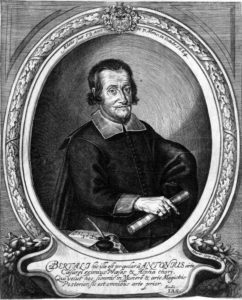 Antonio Bertali (1605–1669) was a hugely influential composer and violin virtuoso, whose modern reputation pales in comparison to the fame he achieved in his own lifetime. He was born in Verona in 1605, where he later gained his early musical training at the cathedral under Stefano Bernardi. In 1662 Bernardi accepted an appointment by the Bishop of Breslau (Poland), and it is assumed that this Habsburg connection led to Bertali’s appointment in Vienna in 1624. Following the death of Giovanni Valentini in 1649, Bertali succeeded him as Kapellmeister of the imperial court. As his education and background suggest, it is north Italian influences that are most apparent in Bertali’s music. In his vocal music, the influences of Monteverdi and Cavalli are seldom far beneath the surface, as is Valentini’s influence on his instrumental music. Bertali often composed in a lavish and virtuosic style, featuring highly varied instrumental and vocal textures. His Missa Redemptoris is one of the monumental celebratory sacred works that he wrote as Kapellmeister at the Imperial Court in Vienna. It is spectacularly scored for vocal forces (eight-part chorus and solo lines) and instruments (strings and brass). This and similar works fulfilled an important role in religious life at court, flaunted the splendor of the Habsburg Empire, and reflected its powerful support of the Counter Reformation. Performances are Friday, April 26, 8:00 p.m., at St. Mark’s Lutheran Church in San Francisco; Saturday, April 27, 8:00 p.m., at All Saints’ Episcopal Church in Palo Alto; and Sunday, April 28, 4:00 p.m., at St. Mark’s Episcopal Church in Berkeley. Advance tickets are $30 general, $25 seniors; patrons under 30 always pay $10. Prices at the door are $35, $20, $10. SFEMS members receive a $5 discount on the advance purchase price when using promotion code “SFEMS” – until 5:00 p.m. on Thursday, April 25; this discount is not available at the door. Order by phone at 650-485-1097 or online at www.calbach.org/tickets.